Standout Fireplace Tile . . . Arts & Crafts Style! 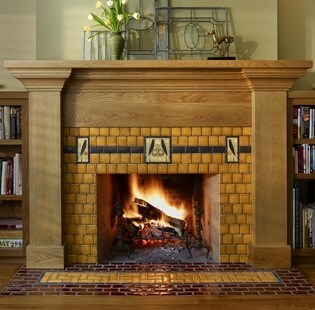 Arts & Crafts fireplace tile is enjoying a resurgence in popularity . . . once again . . . thanks to renewed interest in natural, hand-crafted designs. As beautiful as it is natural, it has a warmth and timeless appeal that makes it ideal for use in virtually any setting! The Arts and Crafts Movement, a British, Canadian, Australian, and American aesthetic movement occurring in the last years of the 19th century and the early years of the 20th century, began as a protest against machine age artificiality. Spearheaded by John Ruskin (1819-1900) and William Morris (1834-1896) in England, the movement sought to create new and better living environments for people by utilizing natural building materials in their homes and by employing fine craftsmanship in assembling those materials. The movement subsequently spread to other countries, including the United States, where it enjoyed immense popularity until well into the first quarter of the 20th century. As the decade of the 1930s got underway, however, changing tastes and the Great Depression signaled the end of the Arts and Crafts Movement in America. Fortunately, another move toward honesty of materials and craftsmanship is steadily growing at present, as many of us turn away from the "plasticization" of the modern world. A renewed appreciation for hand- crafted designs using natural materials is, once again, reviving the fireplace tile designs and production techniques of highly skilled artisans from the past. The Arts and Crafts Movement produced a vast array of tile styles and tile-making techniques. Everything from subway tile to the early English styles of William Morris and William de Morgan to California reproduction styles . . . . . and a variety of looks and finishes ranging from soft, warm muted tones and subtle color blends (below left) to precise geometric shapes and sharply contrasting color schemes (be- low right). The most common . . . . . and popular . . . . . classic Arts and Crafts motifs are the tree, acorn, and pine cone. The following examples, as well as the example above left, depict a variety of ways in which these motifs are incorporated in the tiles. One of the few remaining pottery and tile works from the heyday of the Arts and Crafts Movement in America is Pewabic Pottery in Detroit, Michigan. Founded in 1903 and operated by the same family until the early 1960s, the Pottery fabricates heirloom quality architectural tiles for both public and private installations, as well as reproductions and adaptations of its historic designs. The tile is well known for its spectacular iridescent glazes in rose, green, gold, purple and copper. Pictured below are some striking examples of wall, floor, and fireplace tile from Pewabic Pottery. Ernest Batchelder (1875-1957), another leading designer and producer of fine hand-crafted tile during the heyday of the Arts & Crafts Movement, succumbed to the Great Depression and was forced to close the doors of his tileworks. 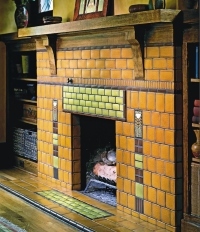 However, the resurgent interest in Arts & Crafts tile in recent years has brought about the opening of new studios dedicated to faithfully reproducing, as well as creating Batchelder-inspired fireplace tile designs, such as those pictured below. Please click here to see more Batchelder tiles. Hand-crafted tile derived from Arts and Crafts styles and designs is truly timeless. Much of it inspired by nature, it is as relevant today as it was a century ago. And very likely, it will be equally relevant a century from now. Please check back often or subscribe to our RSS feed, as we frequently add Arts and Crafts tile designs to our site. MORE Arts & Crafts Tiles! MORE Finely Crafted Arts and Crafts Fireplaces! Spanish Inspired Fireplace Tile Designs! to see more exciting . . . . . In Arts & Crafts Styles! Amazing Arts & Crafts Creations! A New Twist on an Old Theme!